Load Tap Changers (LTC’s) could also be known as a type of voltage regulator. In the Washington DC area, we typically see LTC’s at places of distribution. Your typical government building or privately owned buildings do not use LTC’s. 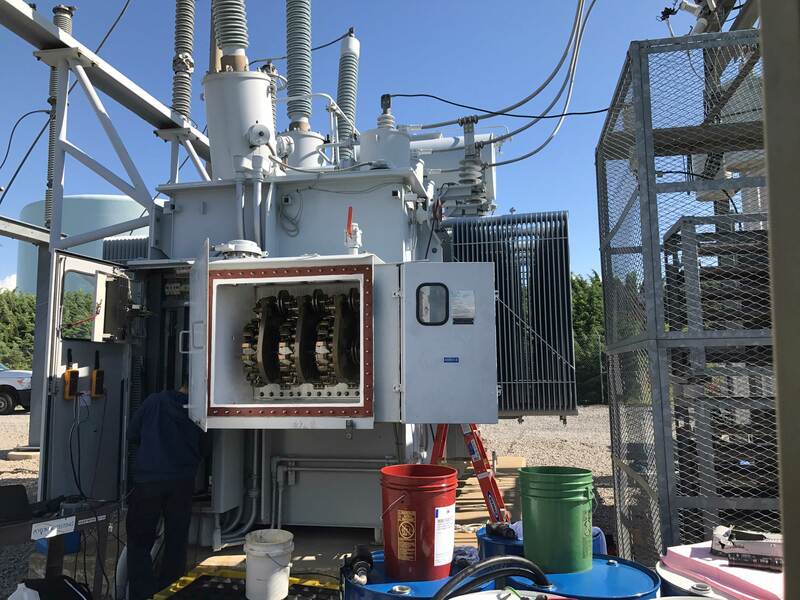 You could even say that businesses that do not own the extra space or property to house a distribution type transformer, would not have a load tap changer on their transformer. What is a distribution type transformer? One could argue that the transformer in their building that changes 480V to 208V is a distribution transformer. That could be true, but in the eyes of a power company or high voltage electrician, everything below 1000 volts is low voltage and can’t possibly distribute power. I am talking about 13,800 volt transformers and up! The specific transformer I will talk about in this post is a 230,000 volt primary transformer. The transformer above, is a picture from the side. It has the oil drained and cover removed from the LTC. Those are the 3 phase main contacts on the secondary of the transformer. The secondary voltage of this particular transformer is 13,800 volts. What is the purpose of a LTC? The purpose of a LTC is maintain a steady voltage as your current draw increases. Take this for example: You are in an office building; it is 5 a.m. and the office building is empty. The load on the building will be minimal. You may be running around 492 volts. Then around 9 a.m. the building is about 80% occupied. You will be running more computers and printers and lighting and HVAC. All of these things will consume more power. As current (amps) go up, guess what begins to decrease? Voltage. So you begin to drop voltage to a 480 volt range. Then the last few stragglers show up to work and you are at 100% capacity. Now your voltage may be around 465 volts. This is an extremely exaggerated example and of course, there are always a lot of variables to change the scenario. But still keeping it simple, an LTC uses a voltage regulator to maintain a specific voltage. So no matter how occupied or unoccupied a building may be, it remains at a steady 480 volts. An office building will never need an LTC, because the power company is probably already using them to distribute power. So they maintain your voltage. Real life scenarios, you would never see that much voltage swing if you have steady utility power. In the video I am about to show, I used my cell phone’s camera and set it to slow motion. These contacts move so fast, that you need to slow it down to verify that your contact sequence always makes-before-breaks. The next two videos will show the actual speed of the contacts changing. You will see why slow motion helps the verification process. This video shows the tap changer riding through tap NA to N (Neutral). On the transition upwards, to reach tap 1-16 raised, the reversing contact switches between NA and N. This is the contact on the top of the video. There are 33 positions but only 16 contacts. The reversing contacts give you 33 different ratios. How does the oil get removed from the LTC tank? Here is a brief video showing the method I use to remove oil. All tanks have some type of port on the bottom of the tank to drain from. All you have to do is mate up with whatever fitting may be there and pull it out with a pump of some sort. This is a home-made pump that we can change direction of flow without disconnecting hoses.